Sometimes, we stumble upon a beautiful destination in the most unexpected ways. Kausani was one such instance. I'd chanced upon it in quite a poetic manner, literally. It was while reading about the famous Hindi poet, Sumitranandan Pant, that I was intrigued about probably his biggest source of inspiration, his birth place - Kausani. If his beautiful poems and prose are anything to go by, then this place was a must see. Named "Switzerland of India" by none other than Mahatma Gandhi himself, Kausani is located in the state of Uttaranchal and is approximately 413 km from Delhi. As always, we decided on a road trip, as we assumed the route to be scenic, since it's a hill station. And we couldn't have been more right. We took the Delhi-Moradabad-Kaladhungi-Nainital-Bhowali-Ranikhet-Kausani route. Expecting patches of bad, narrow or edgy roads, we double-checked the vehicle for spare tyres, engine oil, fuel, etc., so as to not encounter any kind of glitches on the way. The star attraction at Kausani, apart from its beautiful mountain range, was Nanda Devi, the second highest peak in India. Our goal was to reach Kausani the same day, so that we could wake up early next morning to witness the sunrise from Nanda Devi. We started our journey at 6 AM in the morning, with a few biscuits and hot coffee to charge us up. We drove non-stop for nearly 3 and a 1/2 hours before reaching Moradabad. Here, we hastily tucked into some Kulcha/Paratha and Dal at a local fast-food joint before resuming our journey. After driving for another 3 hours, we finally reached Nainital. Nainital itself is a huge tourist attraction, especially the Naini lake. We hired a yacht to explore the Naini lake. The beautiful lake and township around it, with majestic British-era buildings, looked straight out of some fantasy movie. The yacht ride in the lake was mesmerizing and serene to say the least. Having spent more than an hour or so, we left for Ranikhet. The drive through the mountain ranges towards Ranikhet looked picture-postcard perfect. It was hard to resist the urge to stop midway and click pictures, which happened frequently to say the least. After nearly 2 hours of drive, we reached the Ranikhet town. A tad-bit exhausting, it was delightful to tuck into some pahadi food at a famous local eatery. Sitting in the lap of the vast expanse of the mountains, it was hard to drag ourselves back to the cramped confinement of our car. 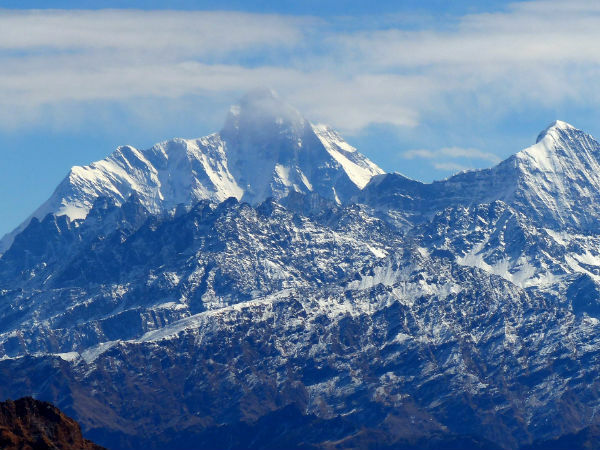 Some of the snow-covered mountain peaks close to Nanda Devi are visible from Ranikhet. The alluring beauty of the peaks egged us to resume our journey with renewed energy. After driving for a little over 2 hours through the beautiful mountain scapes, we finally reached our destination, Kausani. Being February, the snowfall in Kausani was intermittent and the cold, well....bearable. The hotels in Kausani come at all price ranges and almost every hotel offers a view of the mountain peaks. Since it was already late in the evening, we decided to call it a day post dinner, so as to wake up on time for the sunrise. Everyone in Kausani is aware what you are here for, so don't be surprised when the hotel staff starts banging at your door at 5 AM to wake you up, like we were. A bit weary from previous day's drive, we dragged ourselves to freshen up and start all over. The sunrise view from atop the hotel gallery lived up to every bit of its reputation! The snow-capped mountains turned golden in the backdrop of the rising sun with white clouds floating around like balls of soft cotton. No amount of professional photography can justify the beauty of the place, which can only be described as divine. The regal beauty of Nanda Devi made us feel like minions, as we sat in awestruck silence and admiration. After what seemed like eternity, we finally made our way back with the sun shining brightly above us. For the rest of the day, we explored the quaint town and visited the Anasakti Ashram, where Mahatma Gandhi spent some time here. We then went to the place where it all started, the Sumitranandan Pant Gallery. It was heartening to leaf through the works and accolades of the famous writer. His literary contributions were as tall and towering as the Nanda Devi itself! Having achieved the feeling of a day well spent, we headed to our hotel to prepare for our return journey the next morning. It is said that our travels enrich us as a person. Viewing the majestic Nanda Devi, walking around the Ashram where once Bapu had set his foot, and last but not the least, being among the great works of Sumitranandan Pant, was a far more humbling experience than any sermon could be!